This article is about Buddhism. For Taoism, see Five Precepts (Taoism). The Five Precepts (Pali: pañcasīlāni; Sanskrit pañcaśīlāni) constitute the basic code of ethics undertaken by upāsaka and upāsikā ("lay followers") of Buddhism. The precepts in all the traditions are essentially identical and are commitments to abstain from harming living beings, stealing, sexual misconduct, lying and intoxication. A precept is a general rule intended to regulate behaviour or thought. Undertaking the five precepts is part of both lay Buddhist initiation and regular lay Buddhist devotional practices. They are not formulated as imperatives, but as training rules that lay people undertake voluntarily to facilitate practice. Additionally, in the Theravada schools of Buddhism, the bhikkhuni lineage died out, and women renunciates practicing Theravadin Buddhism have developed unofficial options for their own practice, dedicating their life to religion, vowing celibacy, living an ascetic life and holding eight or ten precepts. They occupy a position somewhere between that of an ordinary lay follower and an ordained monastic and similar to that of the sāmaṇerī. In Thailand, they are called maechi (Thai: แม่ชี, IPA: [mɛ̂ː tɕʰiː]); in Sri Lanka, they are dasa sil mata; the Burmese thilashin are also now found in Nepalese Theravadin Buddhism as well; and in South East England, the Amaravati Buddhist Monastery founded by Ajahn Chah has siladhara. Pali literature provides the scriptures and commentary for traditional Theravadin practice. 1. I undertake the training rule to abstain from killing. Pāṇātipātā veramaṇī sikkhāpadaṃ samādiyāmi. 2. I undertake the training rule to abstain from taking what is not given. Adinnādānā veramaṇī sikkhāpadaṃ samādiyāmi. 3. I undertake the training rule to avoid sensual misconduct. Kāmesumicchācāra veramaṇī sikkhāpadaṃ samādiyāmi. 4. I undertake the training rule to abstain from false speech. Musāvādā veramaṇī sikkhāpadaṃ samādiyāmi. 5. I undertake the training rule to abstain from fermented drink that causes heedlessness. Surāmerayamajjapamādaṭṭhānā veramaṇī sikkhāpadaṃ samādiyāmi. For more on the first precept, see ahimsa. In the fifth precept sura, meraya and majja are kinds of alcoholic beverages. In some modern translations, Surāmerayamajjapamādaṭṭhānā, is rendered more broadly, variously, as, intoxicants, liquor and drugs, etc. There is the case where a certain person, abandoning the taking of life, abstains from the taking of life. He dwells with his rod laid down, his knife laid down, scrupulous, merciful, compassionate for the welfare of all living beings. Abandoning the taking of what is not given, he abstains from taking what is not given. He does not take, in the manner of a thief, things in a village or a wilderness that belong to others and have not been given by them. Abandoning sensual misconduct, he abstains from sensual misconduct. He does not get sexually involved with those who are protected by their mothers, their fathers, their brothers, their sisters, their relatives, or their Dhamma; those with husbands, those who entail punishments, or even those crowned with flowers by another man. There is the case where a certain person, abandoning false speech, abstains from false speech. When he has been called to a town meeting, a group meeting, a gathering of his relatives, his guild, or of the royalty, if he is asked as a witness, "Come & tell, good man, what you know": If he doesn't know, he says, "I don't know." If he does know, he says, "I know." If he hasn't seen, he says, "I haven't seen." If he has seen, he says, "I have seen." Thus he doesn't consciously tell a lie for his own sake, for the sake of another, or for the sake of any reward. Abandoning false speech, he abstains from false speech. And how is one made impure in three ways by bodily action? There is the case where a certain person takes life, is a hunter, bloody-handed, devoted to killing & slaying, showing no mercy to living beings. He takes what is not given. He takes, in the manner of a thief, things in a village or a wilderness that belong to others and have not been given by them. He engages in sensual misconduct. He gets sexually involved with those who are protected by their mothers, their fathers, their brothers, their sisters, their relatives, or their Dhamma; those with husbands, those who entail punishments, or even those crowned with flowers by another man. This is how one is made impure in three ways by bodily action. According to the Buddha, killing, stealing, sexual misconduct and lying are never skillful. Now, there are these five gifts, five great gifts — original, long-standing, traditional, ancient, unadulterated, unadulterated from the beginning — that are not open to suspicion, will never be open to suspicion, and are unfaulted by knowledgeable contemplatives & priests. Which five? There is the case where a disciple of the noble ones, abandoning the taking of life, abstains from taking life. In the next canonical discourse, the Buddha described the consequences of breaking the precepts. The format of the ceremony for taking the precepts occurs several times in the canon in slightly different forms, and each temple or tradition has slightly different ordination ceremonies. 1. As all Buddhas refrained from killing until the end of their lives, so I too will refrain from killing until the end of my life. 2. As all Buddhas refrained from stealing until the end of their lives, so I too will refrain from stealing until the end of my life. 3. As all Buddhas refrained from sexual misconduct until the end of their lives, so I too will refrain from sexual misconduct until the end of my life. 4. As all Buddhas refrained from false speech until the end of their lives, so I too will refrain from false speech until the end of my life. 5. As all Buddhas refrained from alcohol until the end of their lives, so I too will refrain from alcohol until the end of my life. The same treatise outlines the option of undertaking fewer than all five precepts, though nearly all modern ceremonies involve undertaking all five precepts. Certainly, committing more skillful and fewer unskillful actions is beneficial. But before entering nirvana, the Buddha said his disciples should take the precepts as their teacher, so few ceremonies are held for partial precept undertaking. There are exceptions, however. Different Buddhist traditions adhere to other lists of precepts that have some overlap with the Five Precepts. The precise wording and application of any of these vows is different by tradition. The Eight Precepts are for upāsakas and upāsikās who wish to practice Buddhism more strictly than through adherence to the five precepts. The eight precepts focus both on avoiding morally bad behaviour, as do the five precepts, and on leading a more ascetic life. The Buddha gave teachings on how the eight precepts are to be practiced, and on the right and wrong ways of practicing the eight precepts. In Theravada Buddhist countries such as Sri Lanka and Thailand, laypersons will often spend one day a week (on the Uposatha days: the new moon, first-quarter moon, full moon and last-quarter moon days) living in a vihara and practicing the eight precepts. The Ten Precepts refer to the precepts or training rules for śrāmaṇeras (novice monks) and śrāmaṇerīs (novice nuns). They are the same in most schools of Buddhism. Refrain from killing living creatures. Refrain from wearing perfume, cosmetics and garlands (decorative accessories). Lay followers undertake these training rules at the same time as they become Buddhists. In Mahayana schools a lay practitioner who has taken the precepts is called an upāsaka or upāsikā (layman or laywoman). In Theravada Buddhism, any lay follower is in theory called an upāsaka or upāsikā; in practice, everyone is expected to take the precepts. Additionally, traditional Theravada lay devotional practice (puja) includes daily rituals taking refuge in the Three Jewels and undertaking to observe the five precepts. Anagarika – one who keeps the Eight Precepts on a more permanent basis, or as preparation to ordain. ↑ Nancy J. Barnes (1996). Christopher S. Queen; Sallie B. King, eds. Buddhist Women and the Nuns' Order in Asia. 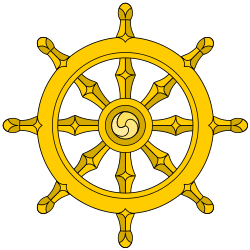 Engaged Buddhism: Buddhist liberation movements in Asia. Albany, NY: State University of New York Press. p. 267. ISBN 978-0791428436. ↑ Karma Lekshe Tsomo (2008). Buddhist Women in a Global Multicultural Community. Malaysia: Sukhi Hotu Dhamma Publications. p. 227. ↑ As indicated in the translation below, sikkhāpada is also translated as "training rule" (e.g., Gunaratana, 2007) and "rule of training" (e.g., Harvey, 2007, p. 199; and, Khantipalo, 1982/95). ↑ "Access to Insight: the Panca Sila (with Pali)". Retrieved 2011-03-14. ↑ "Buddhist Ethics". buddhanet. Retrieved December 6, 2013. ↑ The Pali can be found, for instance, in Elgiriye Indaratana (2002), p. 2. 1 2 3 "Cunda Kammaraputta Sutta" [To Cunda the Silversmith]. Translated from the Pali by Thanissaro Bhikkhu. Access to Insight. 1997. AN 10.176. Retrieved 2011-03-14. ↑ "Sammā-diṭṭhi Sutta" [Right View]. Translated from the Pali by Thanissaro Bhikkhu. Access to Insight. 2005. MN 9. Retrieved 2011-03-14. ↑ "Abhisanda Sutta" [Rewards]. Translated from the Pali by Thanissaro Bhikkhu. Access to Insight. 1997. AN 8.39. Retrieved 2011-03-14. ↑ AN 8.40 (Thanissaro, 1997c). ↑ "CBETA T18 No. 916¡m¨ü¤§Ù¤K§Ù¤å¡n¨÷1". Cbeta.org. Retrieved 2012-12-10. ↑ "CBETA T24 No. 1488¡mÀu±C¶ë§Ù¸g¡n¨÷3". Cbeta.org. 2008-08-30. Retrieved 2012-12-10. ↑ "CBETA X60 No. 1129¡mÂk§Ùn¶°¡n¨÷3". Cbeta.org. 2008-08-30. Retrieved 2012-12-10. ↑ "Welcome to American Zen Buddhist Temple - Vairocana Monastery". Azbt.us. 2003-03-09. Retrieved 2012-12-10. ↑ "The City of Ten Thousand Buddhas". Dharmasite.net. Retrieved 2012-12-10. ↑ Yin-Shun, Venerable (1998). Wing H. Yeung, M.D., ed. The Way to Buddhahood: Instructions from a Modern Chinese Master. Wisdom Publications. pp. 86–87. ISBN 0-231-11286-6. ↑ "The Ten Precepts: dasa-sila", edited by Access to Insight. Access to Insight, 26 May 2010, http://www.accesstoinsight.org/ptf/dhamma/sila/dasasila.html . Retrieved on 20 September 2013. Aitken, Robert (1984). The Mind of Clover: Essays in Zen Buddhist Ethics. NY: North Point Press. ISBN 0-86547-158-4. Bhikkhu Bodhi (1994–95). Dhamma and Non-duality. Kandy: Buddhist Publication Society. Retrieved 2007-11-09 from "Access to Insight" (1998) at http://www.accesstoinsight.org/lib/authors/bodhi/bps-essay_27.html. Bhante Gunaratana (2007). Taking the Eight Lifetime Precepts. Retrieved 2008-02-15 from "Bhavana Society" at http://www.bhavanasociety.org/resource/taking_the_eight_lifetme_precepts/. Elgiriye Indaratana Maha Thera (2002). Vandanā: The Album of Pāḷi Devotional Chanting & Hymns. Penang, Malaysia: Mahindarama Dhamma Publication. Retrieved 2008-02-16 from "Buddha Dharma Education Association" at http://www.buddhanet.net/pdf_file/vandana02.pdf. Khantipalo (1982). Lay Buddhist Practice: The Shrine Room, Uposatha Day, Rains Residence (Wheel No. 206/207). Kandy: Buddhist Publication Society. Retrieved 2008-02-15 from "Access to Insight" (1995) at http://www.accesstoinsight.org/lib/authors/khantipalo/wheel206.html. Thanissaro Bhikkhu (trans.) (1997a). Abhisanda Sutta: Rewards (AN 8.39). Retrieved 2008-02-15 from "Access to Insight" at http://www.accesstoinsight.org/tipitaka/an/an08/an08.039.than.html. Thanissaro Bhikkhu (trans.) (1997b). Cunda Kammaraputta Sutta: To Cunda the Silversmith (AN 10.176). Retrieved 2008-02-15 from "Access to Insight" at http://www.accesstoinsight.org/tipitaka/an/an10/an10.176.than.html. Thanissaro Bhikkhu (trans.) (1997c). Vipaka Sutta: Results (AN 8.40). Retrieved 2008-02-15 from "Access to Insight" at http://www.accesstoinsight.org/tipitaka/an/an08/an08.040.than.html. Thanissaro Bhikkhu (2006). Getting the Message. Retrieved 2008-02-15 from "Access to Insight" at http://www.accesstoinsight.org/lib/authors/thanissaro/gettingmessage.html.